I love tarts. Particularly the smaller ones, which look delicately crafted. And when you add spinach and kohlrabi, you feel slightly less guilty on sprinkling the top of them with lots of grated cheese. The ingredients make 4 small tarts. Take 4 tartlet pans. Oil them and line them with the rolled out shortcrust pastry. The rolled out dough should not be more than half centimetre thick. Bake in preheated 180 degree oven for 15 minutes. I filled the lined pastry cases with red kidney beans. Remove beans and cool. Wash spinach thoroughly in several washes of water. Drain in colander. Steam spinach with whatever water is clinging to it for 2 minutes. Cool and chop roughly. Wash kohlrabi and peel it. Cube it into 1 centimetre pieces and boil in salted water for 5 minutes. While the vegetables are cooking, saute the chopped onion and garlic in 1 tablespoon of oil. When the onion is golden, add the chopped spinach. Cook it for 7-10 minutes to remove any excess water. Add the drained boiled kohlrabi. Add a teaspoon of salt and cook it for another 5 minutes. Cool it. In a bowl whisk the egg, milk and pepper. 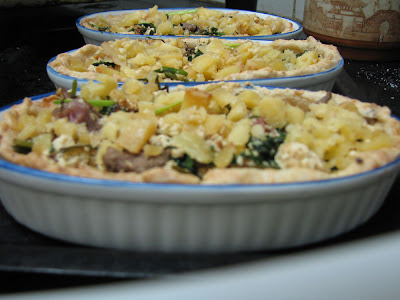 Fill the tart cases with the vegetable mix. Sprinkle with cheese and pour the egg-milk mixture. Bake for 20 minutes at 180 degree centigrade. Cool and unmould from the tart pans.